You can see from that list the Pwn category that there are a few ones so I tried not to overkill myself with difficulty and go for the easiest Heap one, HeapHeaven. As much as I wanted to try the HouseOfScepticism because of the resemblance with the Malloc Malleficarum techniques, when opening it on radare2, it looked quite a bit daunting: no symbols, tons of functions here and there and my inexperience on reading assembly. 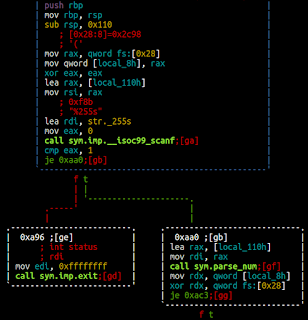 Another goal for this post is to make some kind of introduction to the usage of radare2. 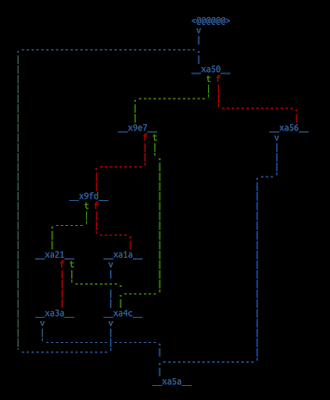 It's quite a good tool with tons of utilities inside such as ROP, search for strings, visual graphs, etc. We can see that the functions should be something like "whaa! ", "mommy? ", etc. 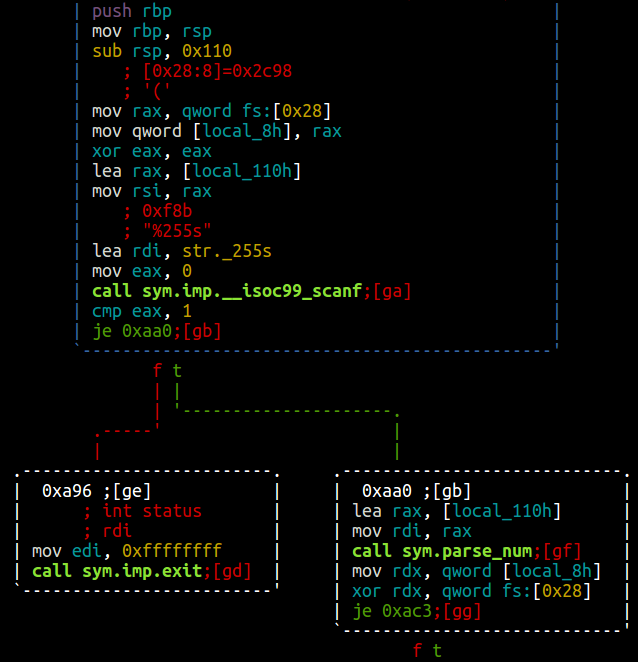 After typing in vv we are presented with the whole lot of functions resolved by radare2 due to the file not being stripped. Yay! By inspecting the first function from the menu, namely "whaa! ", we see a function parsing a number and then a call to malloc. Our intuition is telling us that this function will serve to allocate chunks of whichever size we specify and that, the other functions, will be doing all other heap manipulation. To prove this inside radare2, we browse with the arrow keys to the function we want and then press g to seek to that function position. Then press V (shift + "V") to go to the visual graph representation. It is clearly seen that the function is trying to read, through the scanf function, the format %255s and it will get stored on the argument pointed by the RAX register. 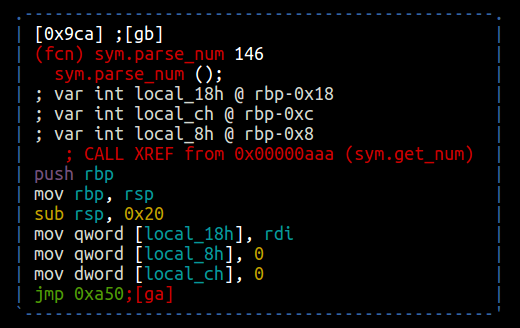 In radare2, it's shown as local_110h which is then passed to parse_num. Zoom out of parse_num function. Here, thanks to the blue arrows that radare2 describes, we can observe that most likely there is some kind of loop logic happening. Since it is parsing a "number" and previously a string was scanf'ed, it would not be a bad assumption to think that it's parsing our string. Indeed, the string is passed into RDI and then it's stored in a local variable local_18h. This is afterwards compared against certain bytes and the counter (local_ch) of the loop is incremented by 2. The operation done inside the loop is actually, "binary adding" through bitshifting with the shl opcode. 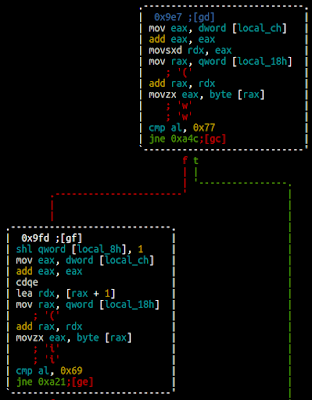 Finally, the resulting operation is stored in another variable to be returned into RAX (local_8h). Second part of parse_num function with renamed variables. This is now quite clearer, isn't it? Basically, it is being compared against the bytes 0x77, 0x69 and 0x61. If it's 0x77 (letter "w"), it will jump to the next char and check if it's 0x69 or 0x61 (letter "a"). If the next char is "i", it will add one to the result. 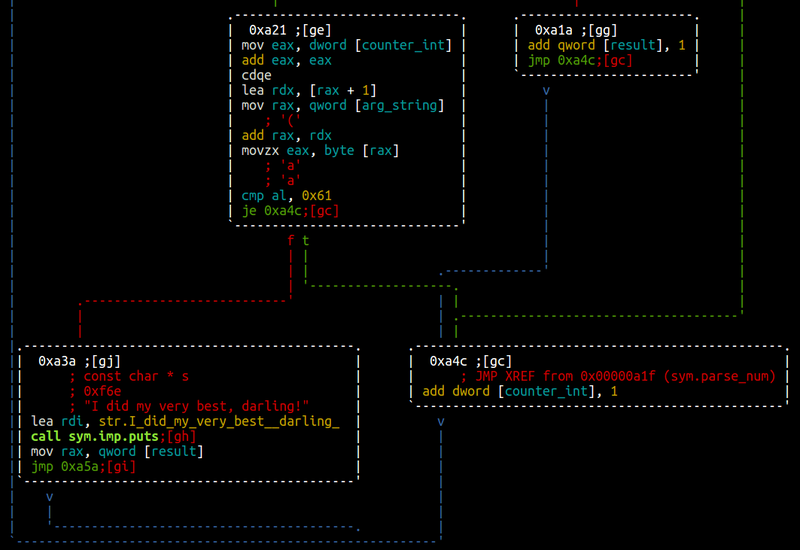 Else, if the char is "a", it will just increase the counter and keep parsing. See the translation? We are feeding binary numbers as toddlers (regarding FluxFingers) speak, "wi" being 1 and "wa" being 0. whaa! : Allocates chunks of a specified size. mommy? : Reads a string from a specified offset. <spill>: Writes to an specified offset. NOM-NOM: Free's a pointer at an specified offset. To code the solution I relied heavily on pwntools by Zach Riggle. The library is just great. 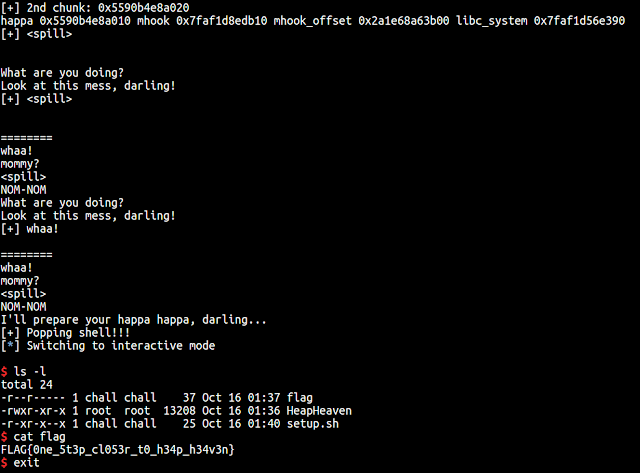 I started writing a function that will translate an hex number to a comprehensive babbling ("wiwawiwa" like). I am padding the string with zeroes to the right. 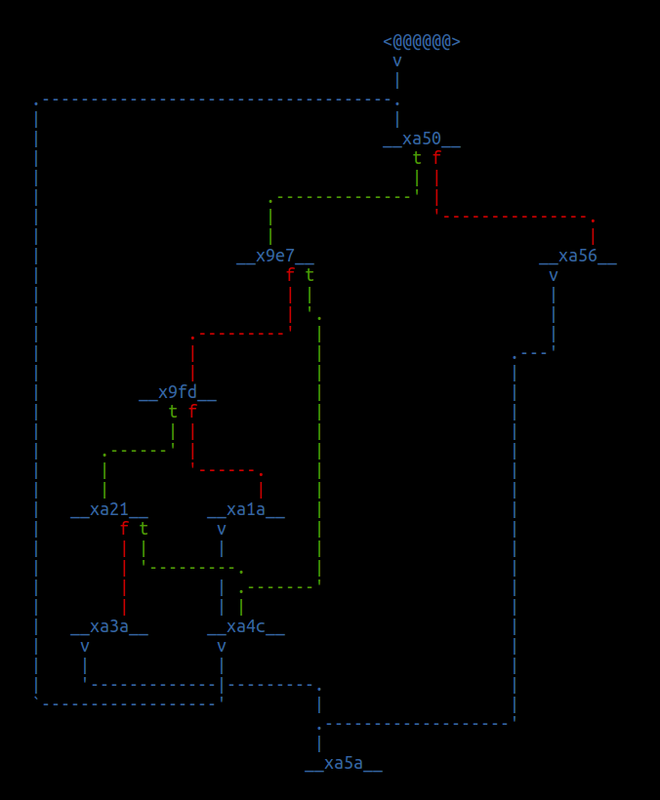 This is because the scanf tries to read %255s and, the loop, won't stop until the counter reaches 0x3f. This would cause trouble because if we don't pad enough chars to the right, the parse_num function will keep reading values from memory and, in case there is another "wiwa" around there, it will mess up our calculations #truestory. I am not going to cover why or where those pointers are set since I think I have covered this matter extensively on previous heap posts (don't be lazy, read them!). However, it's mandatory to explain why we need to free the offset to 0x20 and the offset to 0x280. 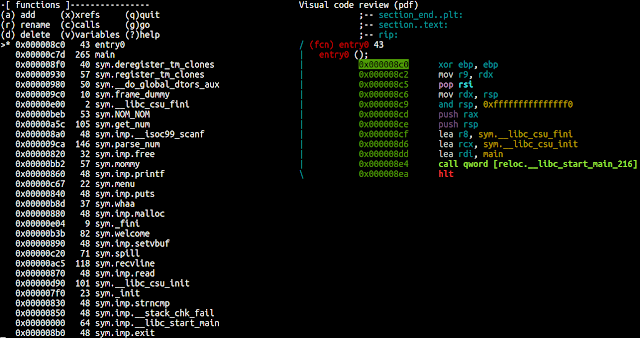 When the program starts, it triggers a malloc(0x0) which, in turn, reserves 32 bytes (0x20 in hex) in memory. As you may remember, fastchunks only set their FD pointer (fastbins are single linked lists), hence jumping over the first fastchunk and going straight to free the next chunk of size 0x130 in memory (we allocated 0x130-0x8 in order to trigger an effective allocation of 0x130 in memory). This will set its FD and BK pointers to the top chunk in main_arena. Now we free the fourth chunk in order to populate it's FD pointer and make it point to the first free'd chunk. 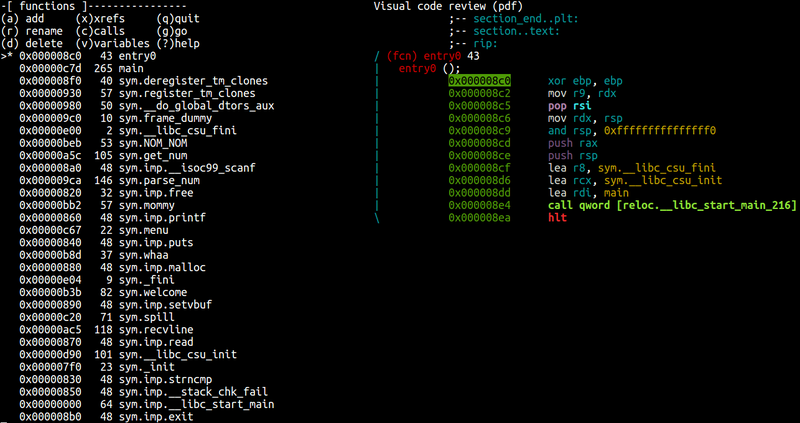 See how the FD pointer is pointing to the previous free'd chunk 0x55cd4bd8020. 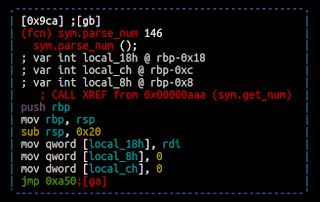 After leaking both addresses, one to the heap and another one inside main_arena we have effectively bypassed ASLR. The main_arena is always placed at a fixed relative position from the other functions of the libc library. 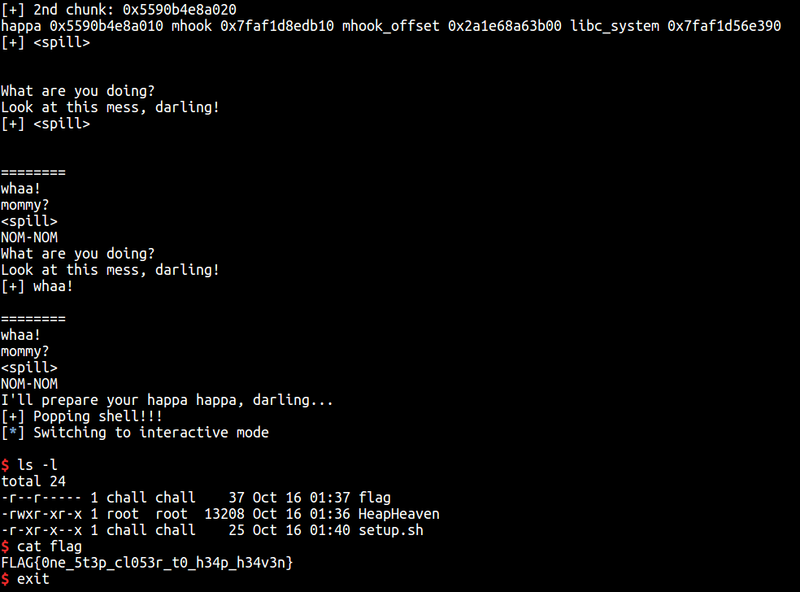 After all, the heap is implemented inside libc. 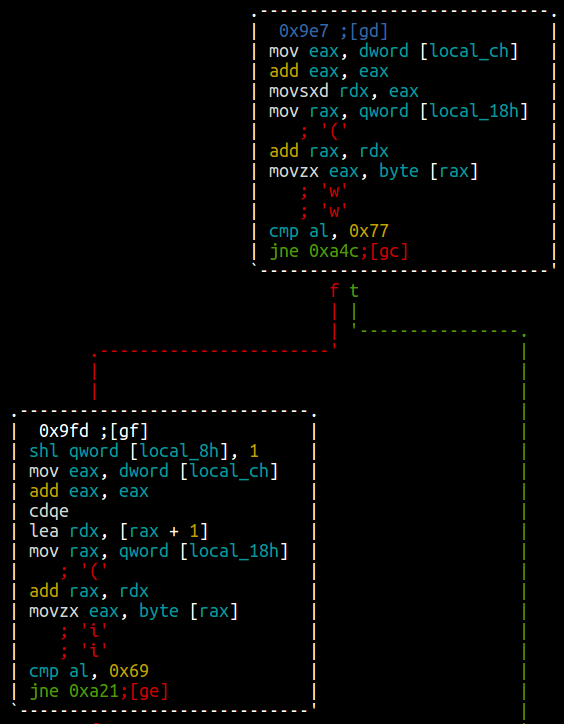 To obtain the offsets to other functions we can just query inside gdb and then move the offsets depending on the libc we are targeting. 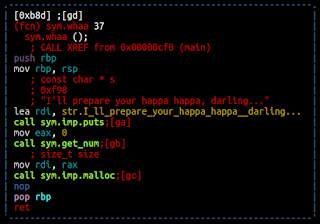 The variable happa_at is the address of the base of the heap. This is, the first allocated chunk of them all. malloc_hook_at represents the absolute address of the weak pointer __malloc_hook. We are using this hook to calculate offsets instead of the top chunk (there is no special reason for this). Finally, the system symbol is calculated and stored into the libc_system variable. We need happa_at because when using the "<spill>" function, we have to provide as the first argument an offset (not an address!). 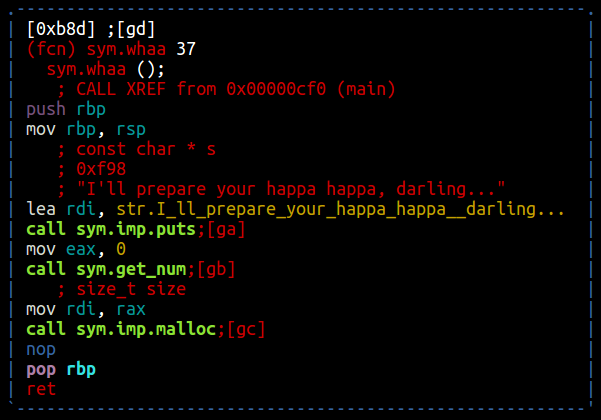 This offset starts from the base of the heap (namely, happa_at). 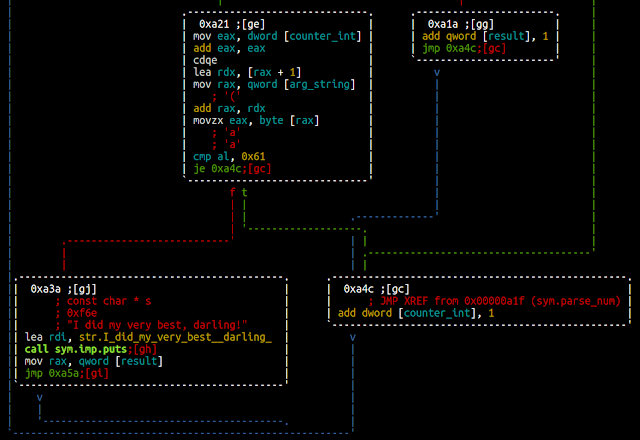 Then, we provide the string we want to write at that offset. Our goal is to write at __malloc_hook the address of system. There are several techniques like creating fake FILE structures, overwriting malloc hooking functions or going after the dtors. All of this in order to redirect code execution. I chose this one since it's the one I feel is simpler enough and it is so convenient as the function we place in __malloc_hook must take the form of malloc. This means that the function we place in there must take an argument just as malloc, so system fits so well. As a final note. This blog was actually published in my actual company's internal blog that I decided to also make it public through my blog since I don't think write-ups are SensePost's-blog-worthy. 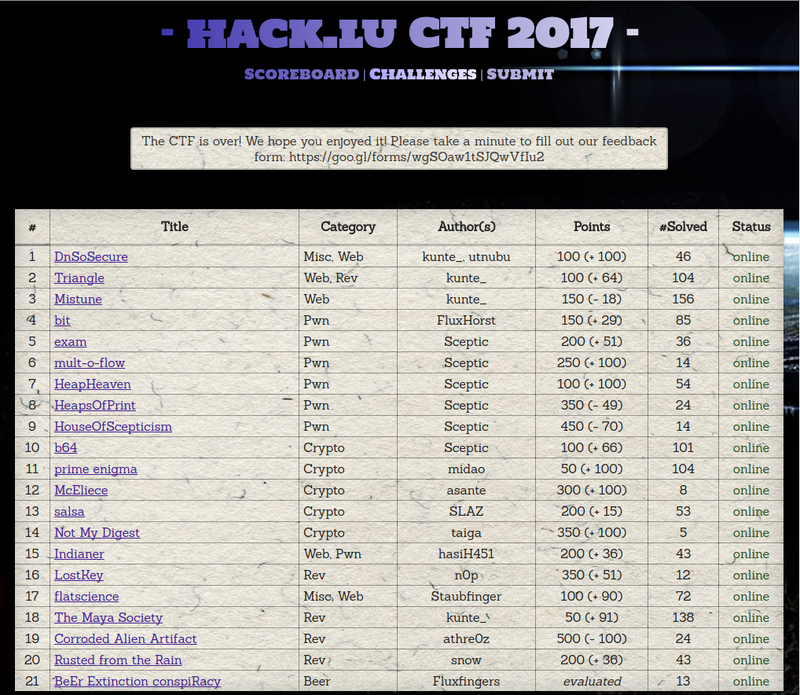 I hope you enjoyed this write-up as much as I enjoyed solving this challenge! You can get the full HeapHeaven exploit code here.